Yeshua is the Word, the Lawgiver and the Light of the World. What if we use the Menorah as a way to illustrate the Ten Commandments? Many teachers have used the Menorah to illustrate biblical concepts. For example, Dr. Hollisa Alewine has a series of teachings called The Creation Gospel that uses the Menorah. There is an out-of-print book called The Mystery of the Menorah and the Hebrew Alphabet by J.R. Church and Gary Stearman, and there are others! This is not meant to replace any of those illustrations, or any others out there. We serve an awesome Creator who is more than capable of teaching more than one thing at a time. The illustration is a visual reference. How do these relate along branches, by twos, by threes and as a whole? Can you see any relationships between neighboring lamps? The illustration will give you some hints on things I see. The thing that struck me most profoundly was the central light. The middle bowl (lamp) is called: Ner Elohim – The Lamp of God. It is also called the Shamash – The Servant Lamp. 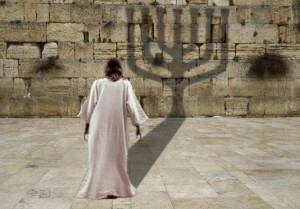 The middle lamp is thus a symbol of the Messiah-Yeshua! All the other lamps ‘point’ to the center lamp. And the Central lamp illuminates all the others! In the first verse in Genesis there are seven Hebrew words. The word in the middle is untranslated. It is a ‘pointer’ or direct object, and is made of two letters: Aleph and Tav (Alpha and Omega). The Shamash, which is a little taller than the rest, casts a light over all, and is central to our understanding. What is the Shamash ‘commandment?’ #4 Remember the Sabbath! Does it fit with our understanding that the Shamash is the Messiah? This was a discovery. I simply placed the numerals on the Menorah in what seemed a logical order. What happened as a result makes perfect sense! The servant candle, the one that is associated with the Messiah is the one commandment that has been in place since the beginning! He is Lord of the Sabbath! The Seventh Day we are told to remember! Perhaps this is why the 4th Commandment is the Door (Dalet). It is the key to our relationship with our Father. He, Yeshua, is our Light, our Door, our Sabbath Rest, and our High Priest. WHAT ELSE CAN WE SEE IN THIS ILLUSTRATION? The central stem holds the first four commandments that are the main trunk from which all the others are suspended. It is the stem where all four commandments that deal directly with our relationship with our Father are gathered. Beginning with our Creator is a terrific foundation for the entire Menorah. The First commandment is the junction of the first branch that holds the Fifth and Tenth commands: Honor Father and Mother and Do Not Covet. Several associations can be made by looking at the relationship between these three commandments. YHVH is our Father in Heaven. He is the source of all good things (our parents/the patriarchs) and the things that sustain us so that we should have no need to covet something that belongs to another. The next junction up the trunk of the Menorah combines the anchor of the 2nd commandment and the commandments Six and Nine. In simple terms these three relate too! The lesson here seems to be that YHVH and our fellow Man are worthy of esteem and respect. Nothing should blur the lines in regard to our Father. All men are made in His image. In a way, the anchor here is Truth. We should never lie about YHVH by placing anything ahead of Him, even ourselves! We must not tell ourselves the lie that we are more important than another by either murdering them or destroying their reputation. This is the junction of the Third, Seventh and Eighth Commandments. This suggests that what belongs to another is to be respected, whether it is a Name/Reputation, Marriage/Covenant relationship, or Property/Truth. What belongs to someone else is sacrosanct! The Top and Middle of the Menorah, the Shamash: Yeshua! The Sabbath DAY, the Lord of the Sabbath! The Door to All of the Feasts of YHVH! I invite you to revisit Are the Ten Commandments for us Today? Part IV if any of this doesn’t make sense. Here is another way to look at the Menorah. 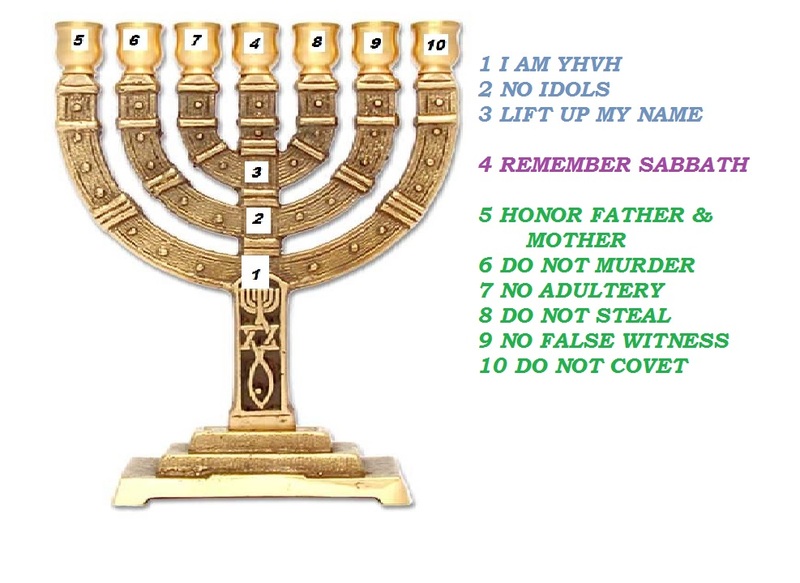 Is it possible to see other connections based on how the commandments are illustrated on the Menorah? What if we look at them by the Central Trunk (Stem) or by each Branch? Study this and see if it makes sense to you. Perhaps you can draw your own conclusions and this will spark a new way of seeing the Ten Commandments. Please share in the comments below! The central Light is Set-apart/Holy: It connects directly with the Father. What a wonderful Teaching! I always am excited when I see the 10 Commandments being shown or taught in new ways, but this is taught as neither “old nor new”..but THE WAY! Thanks again! Thank you so much! Yah Bless! This is truly inspired…from THE FATHER. I have spent much time thinking about the menorah. This is a wonderfully different perspective for us to meditate on and study through. Thank you and praise YHWH for it! !